The U.S. and China have been jockeying for economic influence in Africa in recent years as the region experiences robust GDP growth and presents more opportunities for investment. A recent Pew Research Center survey shows that neither world power has a clear advantage when it comes to the hearts and minds of people in Africa. Among the seven sub-Saharan African countries polled this year, at least six-in-ten in each nation say they have a favorable view of the U.S., including roughly three-quarters or more in Kenya, Ghana, Tanzania and Senegal. Broad majorities also rate China positively. 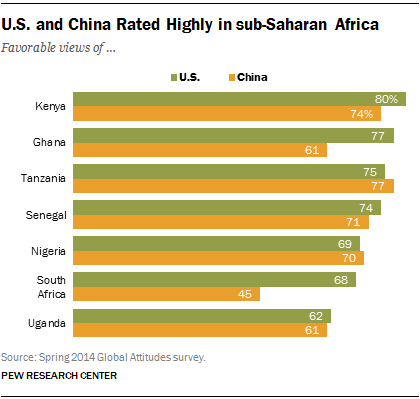 The one exception is South Africa – just 45% express a favorable view of China, compared with 68% for the U.S. Such questions are particularly important to U.S. officials this week as presidents and prime ministers from across Africa converge on Washington for the U.S.-Africa Leaders Summit. The meeting is billed by the Obama administration as the “largest event any U.S. President has held with African heads of state and government” and is meant to strengthen economic and diplomatic ties between the U.S. and African nations. Meanwhile, China has become Africa’s largest trading partner – surpassing the U.S. in 2009 – and just this year announced the formation of the “Africa Growing Together Fund,” a $2 billion investment vehicle created in partnership with the African Development Bank Group. African nations have generally welcomed economic engagement from the U.S. and China. In a 2013 poll we found that in six countries surveyed, widespread majorities said both world powers have a great deal or fair amount of influence on their nation’s economy and that economic influence is positive. For example, 82% of Kenyans said America affects economic conditions in their country and an equal percentage said the same about China. 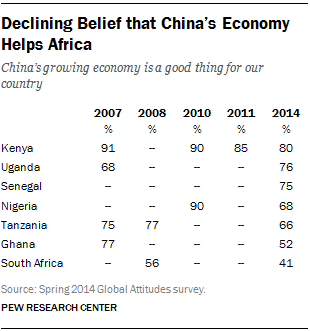 Among Kenyans who saw an American and Chinese impact on their economy, roughly eight-in-ten said that impact was a good thing. When asked which country – the U.S. or China – is more important to have strong ties with, many nations were divided between favoring a good relationship with the U.S. and volunteering that a partnership with both powers is more important. Ugandans were the only ones who clearly leaned towards the U.S. (52%) while Nigerians were the most likely to value ties with China (37%). Nonetheless, Chinese investment in many African countries has led to questions. China has been accused of importing labor rather than providing local jobs, exploiting African workers, increasing countries’ public debt and flooding African markets with cheap goods to the detriment of local businesses. In 2013, Nigeria’s former central bank governor, Lamido Sanusi, described China as perpetrating a new “colonialism,” arguing that the billions of dollars of Chinese investment has done little to improve the lives of African people. This year, there are hints that support for economic investment from China may be waning in some African nations. While at least half in six of the seven countries polled in 2014 say that China’s growing economy is good for their country, this view is less prevalent than it was in previous years in most countries. The decline has been particularly steep in Ghana (down 25 percentage points since 2007), Nigeria (down 22 points since 2010) and South Africa (down 15 points since 2008).